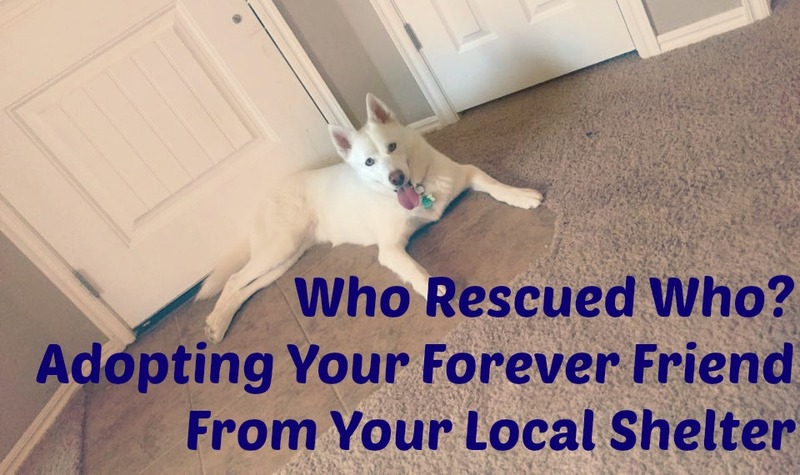 Today I thought I’d talk to you about one of my four legged kiddos, while talking about the benefits of rescuing and adopting from your local shelter. Sasha was the first dog that I adopted from a shelter. In the past, I’d always gotten dogs from neighbors or friends that had a litter of puppies or have purchased guardian dogs for our livestock. But now that I’m in my own home and starting my family, I was able to bring a four legged member into my family. I love huskies. I always have. So when we found Sasha online, we knew we had to bring her home. I am so glad that we were able to adopt her from a shelter, and I know that rescuing, rather than purchasing from a breeder is definitely the way to go. Sasha has become my snuggle partner, confidant, and walking partner among other things (although she pulls more than walks with me…) I couldn’t imagine being without her. She got out of our fence once and was gone overnight. That was a terrible night for me… Fortunately, we had some neighbors that found her the next morning and I was reunited with her! Waiting at the door. She wants to go on a walk! Hoping I drop some dinner! What a sweet post. Our dogs have always been from a rescue. They have always been great dogs and if we decide to get more.. they will be rescues too. We love our dogs.